The HP DeskJet F4200 series of printers is composed of two very unique multifunction devices that differ only slightly in hardware, and come complete with built in flatbed scanners for well under a hundred dollars. If copy and scan functions are only secondary on your priority list, the HP DeskJet F4240 and HP DeskJet F4280 are interesting options for color inkjet printing needs. The print speeds for this compact 3 in 1 device are quite respectable for such a bargain unit, especially for one this dated. With a black and white maximum print speed of 26 pages per minute and a color print speed of up to 20 pages per minute, this little inkjet is up to par in the performance category. Unfortunately, these speeds are for draft quality only and normal quality print speeds run much slower at 9 pages per minute for monochrome and 6.5 pages per minute in color. Best quality printing will prove to be even slower. The HP DeskJet F4200 does not lack in the area of print quality and it is selectable up to 4800 x 1200 dots per inch when printing in color. This allows for excellent photo quality printing that outputs at a rate of 29 seconds per photo, or about 2 pages per minute. 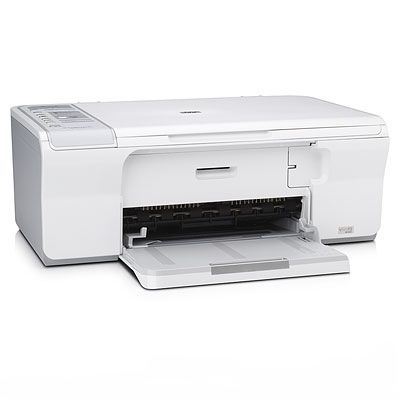 The input capacity for the HP DeskJet F4200 series is very limited. The unit’s output tray is limited to only 20 sheets, while the paper input tray can hold 80 sheets of standard 20 lb paper. Special Media types can be loaded in smaller quantities and fed automatically. Compatible media types include envelopes which can be inserted ten at a time, as well as glossy photo paper which can help to maximize picture quality. Duplex printing is possible, but only manually. Memory included is very limited and also not expandable whatsoever. The 16 MBs of internal RAM limits the printer’s ability to handle complex media operations such as printing mixed text and color imagery. Its copy abilities are also stubbornly limited with a maximum of 9 copies printable at once for the HP DeskJet F4280 and only 3 copies for the HP DeskJet F4240. Other differences between the two models in the series include a maximum print quality of 1200 dots per inch for the HP DeskJet F4240 and a 600 dot per inch max for the HP DeskJet F4280. The HP DeskJet F4280 also lacks the Nova greeting card factory software found with the other model. Review it: "HP DeskJet F4200 "
The ink cartridges for this unit are very inexpensive, but they also carry very low page yields that restrict the HP DeskJet F4200’s usefulness as a high volume printer. 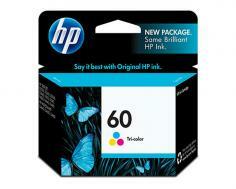 Standard black and color ink cartridges carry 200 and 165 page yields respectively, and cost less than twenty dollars. High yield cartridges are also available to help extend the replacement cycles for the device and can produce up to 600 pages of yield at 5% coverage in black and 440 pages in color. 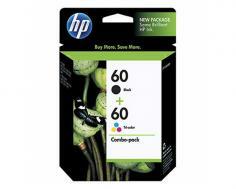 HP also offers ink combination packs and value packs that include a selection of photo paper along with ink.